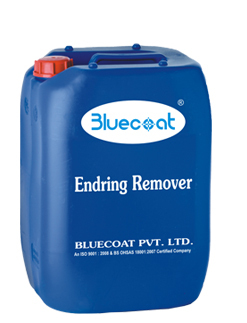 Endring Remover is used for removing endrings out of the Rotary Nickel Screen. Pour Endring Remover in bucket & immerse the endring in the liquid. Allow the adhesive (glue) to soften for approximately 25 to 30 minutes. Remove the endring by inserting a razor blade between screen & endring. The product is aggressive in nature and irritant hence protect your skin. Always wear hand gloves & protect the eyes by wearing glasses. In case the chemical comes in contact with skin, wash thoroughly with water.